To reduce the forces on your arms Peter Lynn offers several solutions, ranging from the simple but efficient backstrap to the racing bred Divine harness. The Peter Lynn Backstrap is a cheap alternative to a harness. Place this large padded strap around your back and you’ll be ready for hours of safe fun with your powerkite. Attach your handles to the backstrap and position it behind your lower back before launching your kite. The backstrap will take the load off your arms while flying. In case you wish to lose the power from the kite, fall forward so the backstrap can slide over your back and head, and the backstrap with handles is released from the kite flyer. The backstrap can be used with 4-line handles & 2-line handles. When you have mastered the basics of kiting all you want to do is fly your kite; jump in a buggy, ride a landboard. However, after a while you will need to give those sore arms a break. The Base harness, complete with spreader bar, is the perfect tool to transfer the kite power onto your body, thus taking the load off your arms. 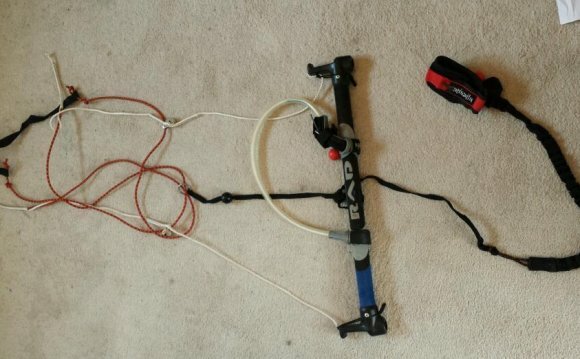 Experience kiting with the features of a proper harness at an affordable price. The Challenger spreader supplied with the harness allows you to hook the harness line running between your handles directly onto the wheel. The Base harness is available in sizes S/M & L/XL to fit a large range of body sizes, as the webbing straps can easily be adjusted to fit your body. The Radical seat harness is designed for optimum comfort while kiting. The Radical has been developed to distribute the load comfortably over the body, no matter where the kite is flying in the wind window. The harness is fitted with an extra soft back support and soft neoprene leg straps. The harness is made from first-rate and hard-wearing materials and has webbing straps running through the harness for maximum durability. The Radical harness features a grab handle and solid leash attachments on the back. The harness is supplied with a spreader bar pad preventing the spreader bar from digging into your chest and protecting your clothing if you are using a wheel spreader. Available in sizes XS, S, M, L & XL, either as a separate harness or with Bullet spreader, Prodigy spreader or standard spreader bar. The Divine seat harness is designed specifically for buggy racing. Most harnesses used by buggy riders are traction kiting harnesses. These harnesses are designed to fit the body comfortably when standing while flying your kite. However in a sitting position the harness is not comfortable when flying for a very long time. The Divine harness was specifically designed to fit the rider perfectly when sitting in a buggy. Above this the harness is made to be extremely smooth around the back to allow easy movements in your buggy seat. The Divine harness is supplied with a spreader bar pad for more comfort as well as preventing clothing such as expensive dry suits from getting damaged. Available in sizes XS, S, M, L & XL either as a separate harness or with Bullet or Prodigy spreader bar.